The recent ISKO UK event Making KO Work: integrating taxonomies into technology offered four very different but complementary talks, followed by a panel session. These provided a good overview of current practice and largely concluded that although technology has advanced, there is still need for human intervention in KO work. Can You Really Implement Taxonomies in Native SharePoint? Marc Stephenson from Metataxis gave a clear and helpful overview of the key terms and principles you need to know when using taxonomies and folksonomies in SharePoint. SharePoint is very widely used as an enterprise document repository, and although its taxonomy management capabilities are limited, when combined with an external taxonomy management solution, it can enable very effective metadata capture. The first step is to become familiar with the specialised terminology that SharePoint uses. Metadata in SharePoint is held as “Columns”, which can be System Columns that are fixed and integral to SharePoint functionality, or Custom Columns, which can be changed and which need to be managed by an information architecture role. For example, Columns can be set as “Mandatory” to ensure users fill them in. Columns can be configured to provide picklists or lookups, as well as being free text, and can be specified as “numeric”, “date” etc. Taxonomies can be included as “Managed Metadata”. Different “Content Types” can be defined, for example to apply standardised headers and footers to documents, enforce workflow, or apply a retention/disposal policy, and many different pre-defined Content Types are available. Taxonomies are referred to as “Managed Term Sets”, and these can be controlled by a taxonomist role. “Managed Keywords” are essentially folksonomic tags, but SharePoint allows these to be transferred into Managed Term Sets, enabling a taxonomist to choose folksonomic tags to become part of more formal taxonomies. The “Term Store Manager” provides some functionality for taxonomy management, such as adding synonyms (“Other Labels”), or deprecating terms so that they can no longer be found by users when tagging (but remain available for search). Terms can also be deleted, but that should only be done if there is a process for re-tagging documents, because a deleted tag will generate a metadata error the next time someone tries to save the document. Limited polyhierarchy is possible, because the same term can exist in more than one “Managed Term Set”. “Term Groups” can be defined, which can be useful if different departments want to manage their own taxonomies. There are various limitations – such as a maximum number of Managed Terms in a Term Set (30,000) and if SharePoint is deployed online across a large organisation, changes can take some time to propagate throughout the system. The process of importing taxonomies needs to be managed carefully, as there is no way to re-import or over-write Term Sets (you would end up with duplicate sets) and there is no easy way to export taxonomies. There is no provision for term history or scope notes, and no analytics, so SharePoint lacks full taxonomy management functionality. There are companion taxonomy management products (e.g. SmartLogic’s Semaphore, or Concept Searching) and it is possible to use other taxonomy management tools (such as PoolParty, Synaptica, or MultiTes) but an additional import/export process would need to be built. So, SharePoint offers a lot of options for metadata management, but is better as a taxonomy deployment tool than a master taxonomy management tool. Joe Pairman of Mekon Ltd, demonstrated a very user-friendly lightweight set of tagging tools that allow non-expert users the ability to add rich metadata to content as they work. This addresses a key problem for taxonomists – how to ensure subject matter experts or authors who are more focused on content than metadata are able to tag consistently, quickly, and easily. By taking a form-based approach to content creation, authors are able to add structural metadata as they work, and add tags to specific words with a couple of clicks. This is particularly effective with a pre-defined controlled vocabulary. Richard Worthington of Historic England described the problems they had when deploying a SOLR/Lucene search to their documents without any taxonomy or thesaurus support for searching. They soon found that SQL searches were too blunt an instrument to provide useful results – for example, searching for “Grant” at first would bring up the page about the grants that were offered, but as soon as they added more data sets, this frequently searched-for page became buried under references to Grantchester, Grantham, etc. Although they could manage relevancy to a certain extent at the data set level and by selecting “top results” for specific searches, the search team realised that this would be a painstaking and rigid process. It would also not address the problem that many terms used by the subject matter expert authors were not the same as the terms general users were searching for. 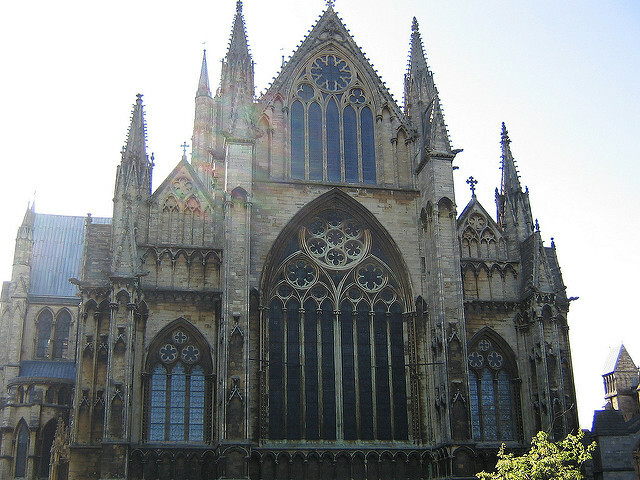 For example, general users would search for “Lincoln Cathedral” rather than “Cathedral Church of St Mary of Lincoln”. So, they have much work for human taxonomists and thesaurus editors to do. Alan Flett of SmartLogic took us through the latest enhancements to their products, showcasing a new feature called “Fact Extraction”. This works by identifying the context around specific data and information, in order to drive Business Intelligence and Analytics. The tool is essentially a user-friendly simplified algorithm builder that allows very specific searches to be constructed using pre-defined “building blocks”, such as “Facts”, “Entities”, and “Skips”. This means a specific piece of information, words to ignore, and entities such as a number or a date can be specified to construct a complex search query. This allows the search results to be defined by context and returned in context, and is especially effective for well-structured data sets. It also means that results are framed in a standardized format, which is useful for analytics. Although techniques such as automated classification, machine learning, and AI are progressing all the time, these still work best when combined with a well-structured knowledge base. Creating that knowledge base relies on human intelligence, especially for the familiar problems of disambiguation and synonym collection, in particular where the content authors have a different approach or level of domain expertise to the end users of the search systems. The panel agreed that for both the creation of thesauruses, taxonomies, and ontologies and for the deployment of these in tagging, semi-automated approaches remain necessary, and so there is still much to be done by human taxonomists, ontologists, and information architects in order to make knowledge organisation work. In a bit of a blog cleanup, I discovered this post languishing unpublished. The event took place earlier this year but the videos of the presentations are still well worth watching. It was an excellent session with short but highly informative talks by some of the smartest people currently working in the semantic web arena. The Videos of the event are available on You Tube. Jon Voss of Historypin was a true “information altruist”, describing libraries as a “radical idea”. The concept that people should be able to get information for free at the point of access, paid for by general taxation, has huge political implications. (Many of our libraries were funded by Victorian philanthropists who realised that an educated workforce was a more productive workforce, something that appears to have been largely forgotten today.) Historypin is seeking to build a new library, based on personal collections of content and metadata – a “memory-sharing” project. Jon eloquently explained how the Semantic Web reflects the principles of the first librarians in that it seeks ways to encourage people to open up and share knowledge as widely as possible. Adrian Stevenson of MIMAS described various projects including Archives Hub, an excellent project helping archives, and in particular small archives that don’t have much funding, to share content and catalogues. Evan Sandhaus of the New York Times explained the IPTC’s rNews – a news markup standard that should help search engines and search analytics tools to index news content more effectively. Dan Brickley’s “compare and contrast” of Universal Decimal Classification with schema.org was wonderful and he reminded technologists that it very easy to forget that librarians and classification theorists were attempting to solve search problems far in advance of the invention of computers. He showed an example of “search log analysis” from 1912, queries sent to the Belgian international bibliographic service – an early “semantic question answering service”. The “search terms” were fascinating and not so very different to the sort of things you’d expect people to be asking today. He also gave an excellent overview of Lonclass the BBC Archive’s largest classification scheme, which is based on UDC. Silver Oliver described how BBC Future Media is pioneering semantic technologies and using the Olympic Games to showcase this work on a huge and fast-paced scale. By using semantic techniques, dynamic rich websites can be built and kept up to the minute, even once results start to pour in. Yves Raimond talked about a BBC Research & Development project to automatically index World Service audio archives. The World Service, having been a separate organisation to the core BBC, has not traditionally been part of the main BBC Archive, and most of its content has little or no useful metadata. Nevertheless, the content itself is highly valuable, so anything that can be done to preserve it and make it accessible is a benefit. The audio files were processed through speech-to-text software, and then automated indexing applied to generate suggested tags. The accuracy rate is about 70% so human help is needed to sort out the good tags from the bad (and occasionally offensive!) tags, but thsi is still a lot easier than tagging everything from scratch. On Tuesday I attended a very interesting event about information visualization and I have written a review for the ISKO UK blog. I was particularly fascinated by the ideas suggested by Martin Dodge of mapping areas that are not “space” and what this means for the definition of a “map”. So, the idea of following the “path” of a device such as a phone through the electromagnetic spectrum brings a geographical metaphor into a non-tangible “world”. Conversely, is the software and code that devices such as robots use to navigate the world a new form of “map”? Previously, I have thought of code as “instructions” and “graphs” but have always thought of the “graph” as a representation of coded instructions, visualized for the benefit of humans, rather than the machines. However, now that machines are responding more directly to visual cues, perhaps the gap between their “maps” and our “maps” is vanishing. Last month I had a wonderful time at the SLA (Special Libraries Association) conference in Chicago. I had never previously been to an SLA conference, even though there is a lively SLA Europe division. SLA is very keen to be seen as “not just for librarians” and the conference certainly spanned a vast range of information professions. The Taxonomy Division is thriving and there seem to be far more American than British taxonomists, which, although not surprising, was a pleasure as I don’t often find myself as one of a crowd! The conference has a plethora of receptions and social events, including the “legendary” IT division dance party. There were well over 100 presentation sessions, as well as divisional meetings, panel discussions, and networking events that ranged from business breakfasts to tours of Chicago’s architectural sights. There was plenty of scope to avoid or embrace the wide range of issues and areas under discussion and I focused on taxonomies, Linked Data, image metadata, and then took a diversion into business research and propaganda. I also thoroughly enjoyed the vendor demonstrations, especially the editorially curated and spam-free search engine Blekko, FastCase, and Law360 legal information vendors, and EOS library management systems. Joseph Busch of Taxonomy Strategies offered an overview of the world of Linked Data. The majority of Linked Data available in the “Linked Data Cloud” is US government data, with Life Sciences data in second place, which reflects the communities that are willing and able to make their data freely and publicly available. It is important to keep in mind the distinction between concept schemes – Dublin Core, FOAF, SKOS, which provide structures but no meanings – and semantic schemes – taxonomies, controlled vocabularies, ontologies, which provide meanings. Meanings are created through context and relationships, and many people assume that equivalence is simple and association is complex. However, establishing whether something is the “same” as something else is often far more difficult than simply asserting that two things are related to each other. Many people also fail to use the full potential of their knowledge organization work. Vocabularies are tools that can be used to help solve problems by breaking down complex issues into key components, giving people ways of discussing ideas, and challenging perceptions. The presentation by Joel Richard, web developer at the Smithsonian Libraries, focused on their botanic semantic project – digitizing and indexing Taxonomic Literature II. (I assume they have discussed taxonomies of taxonomy at some point!) This is a fifteen-volume guide to the literature of systemic botany published between 1753 and 1940. The International Association for Plant Taxonomy (IAPT) granted permission to the Smithsonian to release the work on the web under an open licence. The books were scanned using OCR, which produced 99.97% accuracy, which sounds impressive but that actually means 5,000-12,000 errors – far too many for serious researchers. Errors in general text were less of a concern than errors in citations and other structured information, where – for example, mistaking an 8 for a 3 could be very misleading. After some cleanup work, the team next identified terms such as names and dates that could be parsed and tagged, and selected sets of pre-existing identifiers and vocabularies. They are continuing to look for ontologies that may be suitable for their data set. Other issues to think about are software and storage. They are using Drupal rather than a triplestore, but are concerned about scalability, so are trying to avoid creating billions of triples to manage. Joel also outlined some of the benefits of using Linked Data, gave some examples of successful projects, and provided links to further resources. My paper about my work on the linking and migration of legacy classification schemes, taxonomies, and controlled vocabularies has been published in the Journal for Business Information Review. I have been trying to get to the Content Intelligence Forum meetups for some time as they always seem to offer excellent speakers on key topics that don’t tend to get the attention they deserve, so I was delighted to be able to attend Stephen D’Arcy’s talk a little while ago on taxonomies and ontologies. Stephen has many years of experience designing semantic information systems for large organisations, ranging from health care providers, to banks, to media companies. His career illustrates the transferability and wide demand for information skills. His 8-point checklist for a taxonomy project was extremely helpful – Define, Audit, Tools, Plan, Build, Deploy, Governance, Documentation – as were his tips for managing stakeholders, IT departments in particular. He warned against the pitfalls of not including taxonomy management early enough in search systems design, and the problems that you can be left with if you do not have a flexible and dynamic way of managing your taxonomy and ontology structures. He also included a lot of examples that illustrated the fun aspects of ontologies when used to create interesting pathways through entertainment content in particular. The conversation after the talk was very engaging and I enjoyed finding out about common problems that information professionals face, including how best to define terms, how to encourage clear thinking, and how to communicate good research techniques. In the last two weeks I have attended three very different conferences, with DAM as the common thread. The first was Media Pro Expo, where I spoke on a panel with the DAM Foundation, alongside Mark Davey, Madi Solomon, and David Lipsey. The second was Createasphere‘s first European DAM conference, and the third (co-located with the Createasphere event) was the SPAR Europe Conference on 3D Imaging and Data Management for Engineering, Construction, Manufacturing, and Security. The contrast between Media Pro and SPAR, and their respective audiences, was striking, but so were the similarities of the problems they faced, such as the common need to manage rich media assets and huge volumes of data. Media Pro was aimed at marketing companies, and had lots of amusing exhibits showcasing ways of using technology to create engaging and entertaining campaigns. (I enjoyed playing with an interactive magazine cover linked to a camera that allowed you to put your picture “on the cover” and select your favourite headlines.) Marketing companies are concerned with keeping, curating and mining data not just about customers’ contact details, but also their likes, social connections, and shopping habits in order to create personalised campaigns, so they have become great consumers of metadata. SPAR was all about scanning and mapping, not in the sense that I am familiar with, but literally surveying the Earth and making maps. There were companies that use lasers to create roadmaps, others that carry out aerial surveys, and some that create 3-D representations of buildings. There are systems for surveying and modelling building sites to make sure that construction avoids sewers, pipes, and underground cables, and even a system for creating 3-D photosets of crime scenes to help the police in investigation and evidence gathering. At Createasphere I talked about managing metadata in complex information environments and how we need to treat metadata as content in its own right. There were a range of excellent and diverse presentations, covering topics from the potential of immersive virtual worlds and the huge volumes of data they produce, to descriptions of technical metadata exchange projects. I began to think about the crossover point between the creativity and imagination of the media and marketing companies and the power and accuracy of the surveying companies and how this is going to bring about hugely powerful fantasy “Holodeck” worlds that will make Second Life and the Sims look quainter than the Mickey Mouse cartoons of the 1930s. One challenge for information professionals is to think about how we can create navigation and search systems that do more than just replicate the real-world paradigms we are used to at the moment – I am thinking of things like road signs and timetables – but how to harness the best of semantic techniques and data mining processes to create reactive intuitive worlds that work better than the real one. Ed Lantz of Vortex Immersion Media spoke of “intelligent spaces” that automatically access our data, our assets, information about us, and arrange themselves to suit us. How do we prepare for a world when the likes of Apple’s speech recognition system Siri aren’t genies in bottles, but are the environment around us? We used to worry about ghosts in the machine, but will we end up as the ghosts inside the machine? We worry about putting our assets out there into the cloud, but perhaps we should be thinking more about what it will be like when we step inside the cloud or bring the cloud into our homes? There was a post circulating on Twitter recently describing the library of the future as a hellish place where characters from books come alive and stalk the readers in the rooms. It was somewhat derided as a childish joke, but if we create Holodecks and then try to live in them, it could well come true. The implicit warning it contains that we could inadvertently trap ourselves in such a hellish place where privacy, rights, control, and manipulation are so hidden from view that we lose our sense of self seems to be very mature and insightful. Another post I read was about how interface designers are currently working on “pictures under glass” and need to start to use the full tactile, haptic, and 360 degree expressivity of our physical bodies, such as we are beginning to with technologies like the Wii and Kinect. Theresa Regli of the Real Story Group pointed out that the world we are in now is one in which people still don’t grasp the importance of labelling their images, so immersive virtual worlds seem a long way off, but she also talked of the need for corporate interfaces to embrace “gamification”, as employees are far more productive when their jobs are fun. It may take some time, but I like the idea of a Holodeck meeting room where people make presentations and collaborate on plans by dancing around, rather than sitting staidly at a table. Rather than the hellish library where AI brings fictional monsters to life, it might turn out to be a lot of fun and all that movement may even be good for our health!